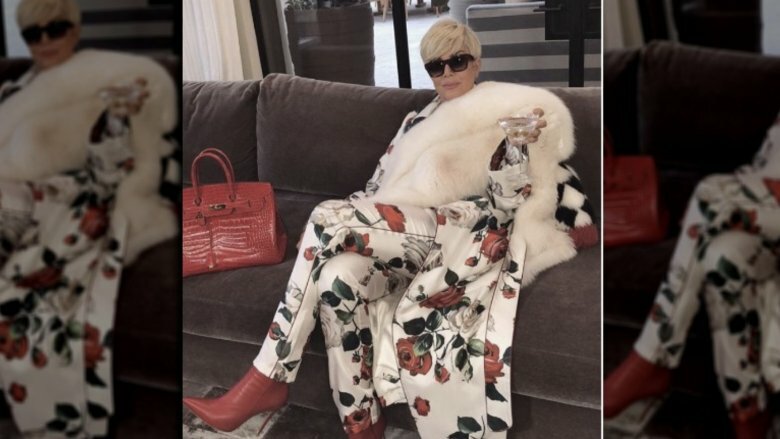 Keeping Up With the Kardashians star Kris Jenner just showed off a whole new look by way of one of her BFF's Instagram posts. 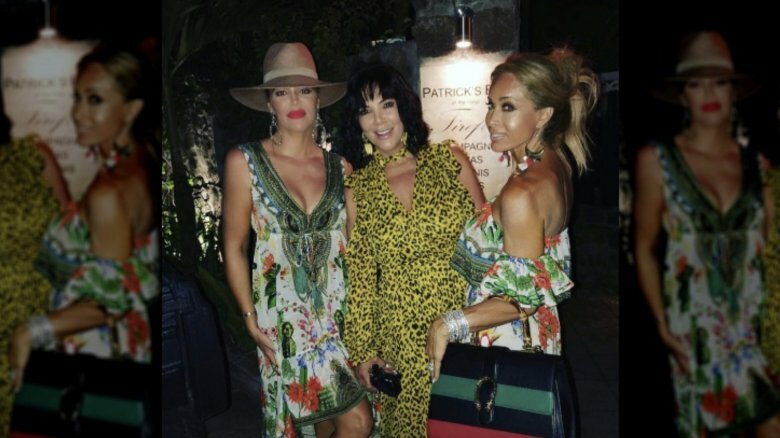 In September 2018, TV personality Faye Resnick, who Real Housewives fans may remember from that infamous RHOBH dinner party episode, shared a photo of herself with Jenner and Khloé Kardashian on social media. At first glance, nothing seems amiss about the picture, but Jenner's fresh style quickly takes centerstage. Wearing a bright yellow cheetah print dress with shoulder and neck cutouts, Jenner can be seen rocking a bold new haircut. Rather than wear her jet black hair in its usual short, chic pixie 'do, Jenner instead has shoulder-length hair with — gasp! — bangs! The post quickly prompted KUWTK fans to praise Jenner, complimenting her on her new hairstyle. Many also left comments saying that Jenner looked more like her mother, Mary Jo Campbell — nicknamed as MJ — who regularly wears her dark chin-length hair down with bangs. Resnick herself made no comment on Jenner's shocking hairstyle switch-up in the Instagram post's caption, instead only thanking Jenner for a "magical journey to the Island of Mustique," a Caribbean island in St. Vincent and the Grenadines. Judging by the other photos that Resnick shared in the same post, Jenner's new hair might not be permanent. In one photo in particular, Jenner appears to have her hair styled in her trademark pixie cut. So, it'd seem that Jenner's suddenly longer hairstyle was simply the magic of a good wig. Jenner has yet to publicly comment on her amazing new look, but, if we know anything about the members of the Kardashian family, it's that they'll eventually address all the little details of their lives on TV. Of course, KUWTK fans know that this isn't the first time that mama Jenner has seriously changed up her style. In October 2017, Jenner's daughter Kim Kardashian posted a photo of her mom with short platinum blonde hair. In the picture in question, Jenner also donned a white and red floral outfit with red heeled boots, a matching Hermès bag, dark sunglasses, and a white fur shawl. Oh, and a martini in her hand. Can't forget that important accessory! As could be expected, Kardashian's picture quickly launched a million memes, as noted at the time by Teen Vogue. But that time, however, Jenner had simply thrown on a wig. Explaining her decision to try out the new look, she said in an episode of her reality TV show, "I've really wanted to go blonde for so long, but the process is really grueling on your hair that I thought I would try a wig first." Jenner didn't wind up making the blonde hair permanent until the beginning of 2018. "January 2nd back at work here we go!!!" Jenner wrote in a social media post besides a photo of her freshly dyed blonde locks. And, fortunately for Jenner, her often-judgmental family was all about her blonde hair. "I think it looks really great," Kim Kardashian told her mother after first seeing her with the blonde wig. "It takes, like, a really strong woman to pull off this icy blonde." Kardashian went on to compare Jenner to Meryl Streep's character Miranda Priestly in 2006's The Devil Wears Prada — which Jenner took as the biggest compliment. "Miranda Priestly represents this amazing chicness and New York attitude," she shared in a talking head interview for KUWTK. "And now I'm looking in the mirror, and Kim is right. I mean, we are the same person." 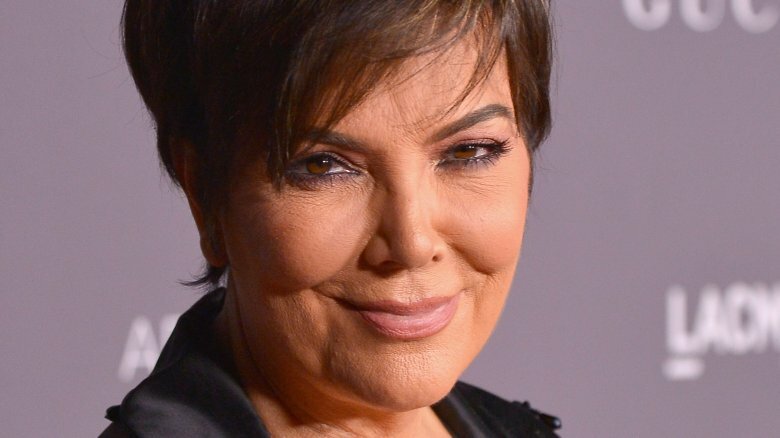 So, what's next for Kris Jenner? What new look is in her future? Well, while we definitely want to see more of her with long hair and bangs, we also really want to see her dye her shoulder-skimming hair blonde. What a look that would be! And, of course, we'll gladly watch any and all of her potential transformations on Keeping Up With the Kardashians!